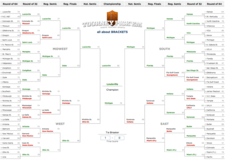 Congrats to Dylan, the winner of this year's AOA NCAA Tournament Pool. He bested a field of 46 other competitors in AOA's pool. And for that he now sips the sweet nectar of victory. In this case, that nectar will probably come from Stewart's, because he won a $25 gift card from there. Dylan correctly picked 41 of 63 games in this year's tournament, compiling 141 of a possible 192 points. 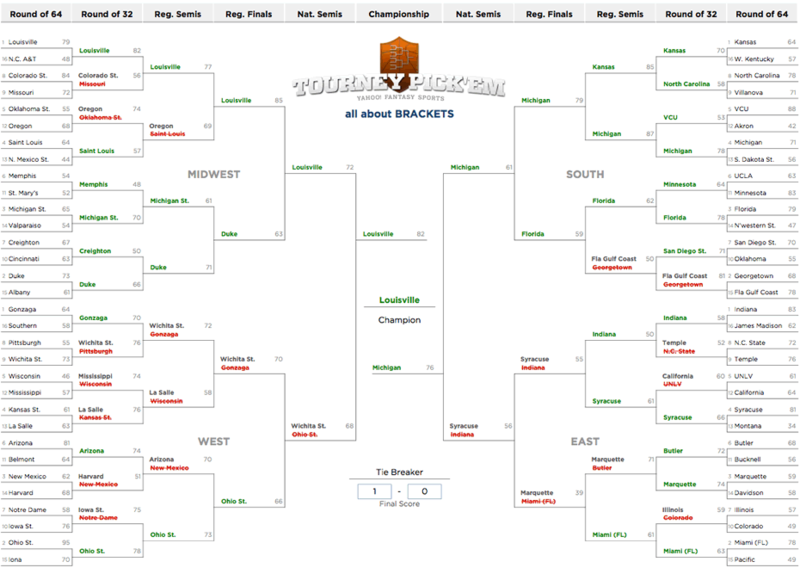 He even correctly picked the final match-up: Louisville vs Michigan (with a Cardinals win, of course). His bracket, which is posted in large format here, ranked him in the 99th percentile of all brackets in Yahoo's Tournament Pick 'em game. After the jump, the top 10 from this year's pool. Thanks to everyone who played. Also: Special mention to Colleen for being the only person in the pool to pick UAlbany to win the whole thing. I couldn't have done it without Uncle Drew. He taught me what this game is all about. congrats! i like your tie breaker (1-0), predicting the worst game in the history of basketball. i'm glad you weren't right about that one. I thought it was Price is Right rules.